Back in July, I made a visit to Calgary where a friend took me to the Sushi BBQ Inn, an all-you-can-eat Korean and Japanese restaurant. Located in a strip mall on an extremely busy major street in the city, the restaurant is decorated with a vaguely Japanese look made up of Asian decorations and screens. Each table has a built-in gas grill where you cook your own food. Menu items are a mixed of cooked and raw foods, including Korean BBQ seasoned meats, vegetables, soup, dessert, sushi and sashimi. My friend does not like raw fish so I, being greedy for all things sushi and sashimi, ate most of that. The fish quality was fine, but cut thinly and was not memorable. The sushi were typical rolls and I would probably not order them again. My memory is a bit hazy but I believe there were only cooked items inside the rolls. The meat was sliced thinly, probably for fast cooking but possibly also so that you didn’t use up so much meat. It was seasoned well, but it didn’t taste like the Korean BBQ that I am used to. Something in the flavour was missing, and I’m not sure what it was. I ordered some salmon to grill, and was a little disappointed but not surprised to receive a plate of those bits of salmon that they couldn’t use for sashimi. 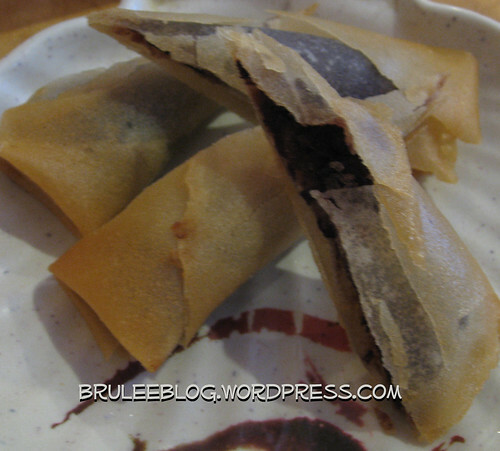 I was interested to see a few desserts included on the all-you-can-eat menu, and we ordered a plate of red bean spring rolls. They looked great, but were ultimately too greasy. Like most all-you-can-eat restaurants, you get what you pay for. Some places are a better value than others. In this case, I would say some menu items are definitely better than others. My suggestion is to stick to the food items that you cook for yourself, as well as maybe the miso soup and sashimi. Forget about the desserts and fill up on fish and meat. 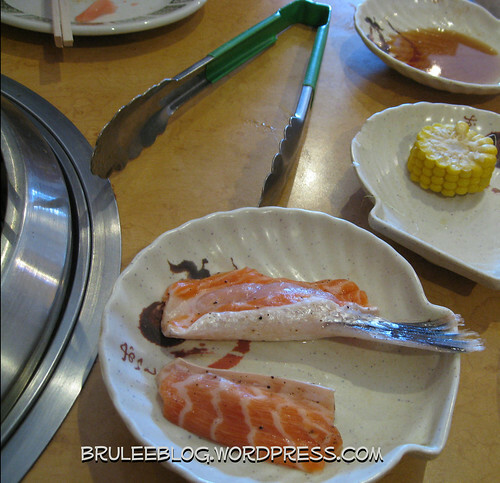 I’ve been to Sushi BBQ Inn a couple times now, and I actually like the cuts of salmon they give you to cook yourself. Yes, they have bones, and look like odds-and-ends, but it works much better for BBQ-ing than a prettier, boneless cut would. We did actually have the tapioca milk as well, which tasted fine but was mostly liquid and definitely could have used more tapioca. Didn’t think about mixing it with the jello! I don’t mind the bones and fins on the salmon, but I wasn’t too happy about the scales. I think if the pieces were a little bit bigger it would have made the effort it took to eat them more worthwhile. 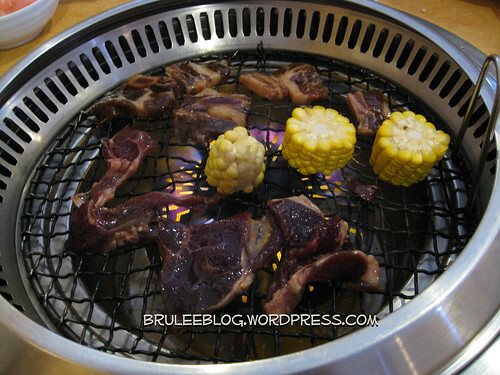 Do you have past experience with Korean BBQ and did the meat seasoning taste the same to you or different at Sushi BBQ Inn? Appreciate you taking the time to deliver this visit report (as you had mentioned on our site recently). Not sure if I’d list it on the places to visit when I am back in Calgary next time, but nice to know about regardless. I generally avoid buffets and AYCE of any cuisine, so you can see where I’m going with this (or rather not going to).